We construct our lives and the world we live in, with words. Since I spent my first 19 years knowing no more than a handful of English words, I am a voracious reader on the lookout for the next treasure to add to my collection of word-bricks. Hellacious—a word used by a journalist whose work continues to enliven the activist in me—to describe her IVF journey, was an adjective not in my active vocabulary. Now thanks to this journalist, it is. Though I will certainly never use it in connection to an IVF cycle. We are the co-creators of our IVF experience. Yes, I do understand that in the midst of an ART treatment cycle the stakes appear to be higher than ever before. Especially if we’ve been wishing for a baby for longer than we’d like to admit. But we are not victims. We can choose to live our in-vitro cycle as a scary, panic- driven experience or a birthing journey of revelations and healing; a journey that compels us to align our fragile human Self with the Unexplainable Mystery orchestrating the arrival of our child. The same Mystery that governed our own coming into the world. I do agree that it’s a tough call to be asked to trust that much, but it’s not hellacious unless we make it so. We must pay attention to the words we use as building blocks of our lives, because our fertility journey is not only about birthing inconceivable babies. It’s about birthing our inconceivably fertile, creative Selves. And the perspective we gain throughout this pilgrimage toward parenthood will guide all our consequent creations. 43 Mothers of college students in Mexico waiting to hear about the fate of their sons who disappeared is a heart-halting, hellacious reality. The company that flooded the Kalamazoo river with more than 840.000 gallons of tar sands crude, is planning another pipeline expansion. Often, our bewildered eyes can barely take in another headline. Still we must from time to time muster the courage to read them. To learn about the world we live in which we are response-able to repair. What if we were to notice the fertility -friendliness of the word-bricks we use in the next few days, and replace the ones that no longer serve us? I read this post going through some of the deepest questions I have asked myself in this journey. Questions like, why would something be given to me showing my fear then feeling myself have joy, peace, and hope all to see it end so quickly. As I wrestled with my heart and mind the other day on my hour and half drive to acupuncture I think I had this moment where I found my truth. Before I surprisingly found out about my last pregnancy I told myself I probably could not get pregnant on my own anyway. I had not gotten pregnant in over a year and we had been trying. We were just going to start our donor egg journey and I found beside the above orphan statement I felt a statement of I don’t know if I could get pregnant or carry a child even with someone else’s genes. I know I had shared this on the conference calls and had moments where my visionary knew that anything was possible if I could just let my orphan feeling go. So if I needed anything to show me my own truth maybe this child was it. I was given this gift to show me that not only can you get pregnant, but hey you can carry a child whether it be your own or some one else’s eggs. Maybe just maybe if I was not given this gift and started my donor egg path I would have let my orphan of fear out shadow any visionary or um that was present. I have been doing some imagery, but lately I just feel like doing nothing except being present for any emotions coming forward be it anger, sadness, guilt. The range of emotions are limitless, but I am doing my best to just stay open for my healing. So funny how you can read something 100 times and can’t get any meaning from it and then, BAM! 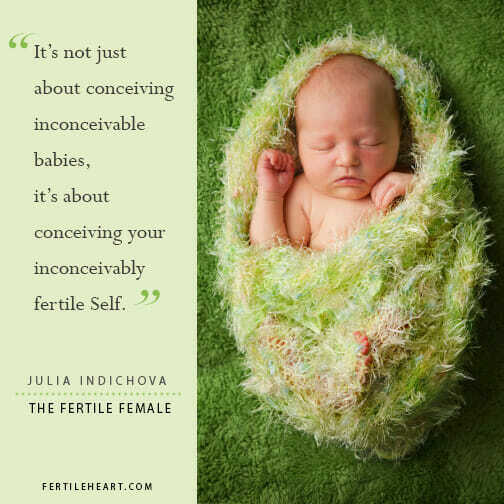 I just reread the quote ” It’s not just about conceiving inconceivable babies, it’s about conceiving your inconceivably fertile self. ” Yup, that’s it!! Definitions for conceive: 1. become pregnant with ( a child); 2. for or devise ( a plan or idea ) in the mind. I need to conceive in my mind (and heart) that I can conceive in my womb. Hellacious does seems like a very peculiar choice of words to describe something that is your choice to do, that many women would like the opportunity to have that option but can’t b/c of cost etc, and is not appropriate for everyone and is not necessarily fun, but can result in bringing your child to this world. The comments above about word choices are so important. I resonated with what Bailey said. Recently, I realized I don’t need to ‘fix’ my body. There is nothing wrong…it is just talking to me and I need to listen to it and let it guide me so I can continue to make the most nourishing of choices and live fully. That is awesome! You don’t need to fix your body, you just need to listen to it. Wonderful! I was struggling with posting on this blog for the last week and it finally “came to me” today. When I talk about my journey, I tend to depict things in the context of “what is wrong with me” and then list out all of my “problems”. I have a very good friend who tells me all the time adamantly “THERE IS NOTHING WRONG WITH YOU. Stop saying that.” And in re-reading this blog, I realize how right he is and how much damage I am doing to myself with my own words. I am going to make a concerted effort to try and view things in the context of “this is where I’m at in the present moment” and not allow the elements of my current physical composition to present themselves as hard stop limitations in my mind. (Not limiting myself to reductive science, as Julia says.) Thank you Julia for the catalyst blog. Smart friend! I agree with you.. and him. I often do that too. In fact last week I caught myself when my sister asked what was going on “with the baby stuff?” I said, “well my eggs are dried up. ” I pretty much shocked myself when I said it because that belief comes from the white coats and I bought into it! My eggs are as alive and vibrant as I am! If your eggs are half as alive and vibrant as you are L, you are in most excellent shape. But I agree, it’s so easy to fall into the trap. Good for you for catching yourself. Bailey your words were exactly what I needed to read when I first saw them yesterday. Thank you. I am trying to get away from using ‘positive’ and ‘negative’; in a week that has brought me extremes of what I would ordinarily have called both kinds of news. Trying to make room for all of it, without weighing joy and pain against each other, and just recognizing that they coexist, but do not have to balance. Your last sentence was beautiful Ruth. Really struck me. Easier said than done, but I suppose you. Your post was very enlightening and helpful. I often find myself in the same trap of thinking something is wrong with me or worse I have done something wrong or not enough of the right. Thanks for the reminder to not to reduce myself to reductive science. Its so true. Cristy. The “I’ve done something wrong” or “I regret things I’ve done in this past and feel like I haven’t done enough to make up for them” traps are also ones that I fall into from time to time. It’s funny, because i will think I’m past it and then I catch myself apologizing to my husband (and the universe) for something I’ve done, rather than celebrating the fact that I’ve overcome it. I feel you girl. Stay strong. Thanks Julia for this post, and it’s inspiring to read other’s comments. This morning I woke up saying to myself “I’m exhausted, I’m depressed” and these thoughts usually lead to becoming evidence that I’m not capable mentally or physically of bringing a child into this world. But this morning I was able to stop that story from running. I did the Imagery practice ‘Room of Fear’ which helped, and then was able to take much better care of myself today. Reflecting back on my one and only IVF I realized a long while ago (after I began to work with FH and the tools) that I allowed myself to swept up in a wave of manic and panicked energy, rather than as Tanya so beautifully stated, a tide of wonder and excitement. I looked at IVF as my last and only path to having a biological child, so naturally I ceded all my power to the fertility wizards ( i.e. anyone in a white coat. I had what I call a ” traumatic experience ” mostly as a result of my own behavior and reactions. I have found myself singing Julia’s song, ” is this longing in my heart a gift or a burden…” a lot these past few days. I have been wrestling with this longing of late, sometimes wishing I did not have this desire so much and feeling exhausted and overwhelmed with my journey. I had an A-HA moment at the acupuncturist’s office on Saturday. I was discussing how when my parents had bought our home in San Diego ( when I was 11) I remember thinking once my dad retired from the Navy, I would finally have a family and then I would truly be HAPPY. Instead, my dad had helped buy the home so we would have a place to live when he left the family and divorced my mom. I realized that I am still waiting for ” my family ” which I equate with getting pregnant and having a baby. So in my mind I would finally be truly HAPPY when I had the baby. No pressure for my unborn child at all- talk about a clarifying moment. I am counting on the baby to make me happy- that realization was my next guidepost and an orphan I need to work with. I think those thoughts are part of the on going perspective I gain on my pilgrimage to meeting my child. I need to use my words carefully so I do not burden my heart or my unborn child. Oh, Heather…I see that 11 year old and I send her love! Thanks Julia- I so appreciate your unwavering support and continued guidance on this journey. It’s been a long winding path and I still have a ways to go. Thank goodness I have all these ladies and you to help keep me going when things seem overwhelming and impossible. Wow, Heather, that is such a powerful realization that you had! It gave me chills just reading it. I’m so glad you were able to uncover that orphan. Like Julia said, sending love! Thank you Tanya! I appreciate the love! Wow such heartfelt words. Thank you for sharing your revelation they are very inspiring. You are on your way to birthing a stronger and healthier mommy. Thank you Christy- that means a lot to me! I hear that, my friend. I caught myself feeling I’m not a real mom because I don’t have the ideal number of children I’ve always wanted. I keep waiting for this final baby to show up so I can feel like I earned my mom diploma and “graduated.” I know how crazy that sounds, but realizing this line of thinking really helped me see, as you said, the pressure put on this unborn child! This post is just perfect for me, as it is something I have been reflecting on since the last teleconference, when I talked about the “guilty” orphan. The next day I was utterly shocked to find myself using the word ‘punishment’ towards myself, for some slight error. I’d had no idea I was being so unkind. I have been noticing the language I use, to myself and others ever since. As findingfaithful wrote, it especially surprising when I’ve always loved the power of words in novels, poetry, drama and my own writing! Pretty amazing the stuff we do to ourselves. thanks so much Ruth! “We are co-creators of our IVF experience.” I would like to think that includes any of the ART road we travel. While I never went the route of IVF, strictly because it wasn’t covered by my insurance, I did use some ART. I did have the OVUM tools the firs few times I tried and yes, it was a hellacious experience for my not yet born SELF. Since using the OVUM tools, my last try w/ART (although not resulting in a pregnancy) was actually a beautiful experience. One filled with joy, triumph and pure delight. I don’t regret that decision at all. Rather I take these words, these feelings, and continue to meet my child halfway. Lori, you are without a doubt becoming “fertiler and fertiler” each day! I also hear the pain of the contractions, but you’re moving through them, recognizing them for what they are and the “lover” in you keeps coming through for you and for the people around you. Pretty cool! What have I gained from this pilgrimage, this long way home? I think I am more patient and considerate towards other people’s difficulties and their perspectives of them, my own voice is stronger in deciding my next step, my next treatment as I know that only I know what is right for me; I have gained a great deal of knowledge and wisdom about fertility challenges and I look forward to one day being able to help and counsel others; I am much wiser now about dealing with difficult feelings and I have learned about the power of imagery, self-release through body truth and language; I am engaged with my diet and get satisfaction from following a healthy lifestyle; and I have met Julia who I hugely admire. I wanted to try to articulate what I’ve gained, in response to this post, as I remember when I first read in “The Fertile Female” or “Inconceivable” Julia describe this journey as a gift (or something along those lines). I remember I used to say it over in my mind, feeling a very long, long way from that and wondering how she could believe that something so ‘hellacious’ could be a gift. But it stayed with me, and on some level I thought that if I subscribe to Julia’s practice I might begin to see that perspective and that could only be a good thing as I was on this road whatever. And I can see now that, for me looking back at my old self, it is a gift – and I wouldn’t trade it all tomorrow for the highway instead. This blog could not have happened at a better time. For most of my life, I have ignored the power of words I say to myself. Which is crazy because I am a writer who adores words and knows how powerful they can be. My company motto is “The pen is mightier than the sword” for Pete’s sake!! And yet I would not hesitate to tell myself I’m too old for another child, too selfish for wanting more, too this, too that. When I sit back and notice all the harsh or judging words I say to myself, it’s astounding. I accept your challenge, Julia. For the next week, I’m going to be very aware of what I’m saying to myself and work at changing my language to one of fertility instead of frustration. I’ve been so upset and angry today, feeling like I’m walking in circles instead of toward my child. I felt like I was at a fork in the road–give up and keep going down orphan alley (as Katy says) or walk in the light. I want the light–and this blog helps pave the way a bit more. It makes my day, K. when someone accepts my challenge. Maybe, just maybe, you could jot down an example of Orphan language and then a V-rooted translation? Oh I love this idea Julia! I really need the practice. I have mastered the art of using words to eat away at my soul. My orphans are very verbal! For example, I’m constantly saying things these days like “I’m too old,” “I have old eggs,” “I’m older than dirt,” “like we’ll ever have another baby,” “I can’t get pregnant easily,” “I have a problem getting pregnant,” “I’m fighting the clock,” “I’m infertile,” etc. etc. I know these are toxic to me and my unborn baby, but these thoughts and words happen so fast, I don’t catch them until the damage is done. The trick for me is to realize I’m spiraling down this tunnel, and then rewrite the script. So instead of saying “I’m too old,” my Visionary words could sound like “I’m the perfect age for this stage of my life” or “women with a few decades under their belts make better moms.” “I’m infertile” can become “I’m taking the scenic route to my baby so I’ll be a better mom.” This will take practice, but I’m game. Thank you, Julia! Good luck with the workshop tomorrow. I know I lived that way “pre-fertileheart”. I believed I was walking a Hellacious road and was somehow cursed to not be able to bare any children. I am so glad I found this work! I realize now I was walking down orphan alley! I am so glad I am learning how to recognize and help her heal. There are hellacious headlines – people killing each other with road rage. I dont understand it. I dont know what to do to help heal it? I can only think continuing to help myself heal and hoping to bring the tools I learn to my unborn child and walk it, I can help a tiny bit of the world. You are helping and healing, Katy, I do believe that the collective consciousness we co-create can affect us all. Consciousness is contagious. I too, remember my pre-fertile heart days. I didn’t treat myself very well. I was constantly disappointed in myself. I would say terrible things to my body.. I shudder now to even think about it! Then I found fertile heart and it changed me. How on earth COULD my body function and live properly when I subjected it to such hostility?!? My body works the best and feels the best when I love myself, when I nurture myself, when I listen to and trust myself. 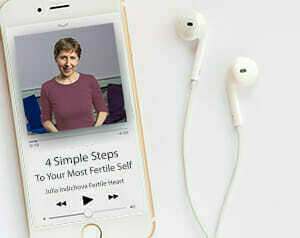 Thank you Julia and thank you Fabulously Fertile Mamas! YES. So on point, Julia “Aligning our fragile human self with the unexplainable mystery orchestrating the arrival of our child…” That sentence stopped me in my track. THAT is the gift that you give us. You teach us to ALIGN. It is difficult to do, but so very worth it. Such a beautiful gift you have, Julia. I 100% agree with you that it is our choice how we experience an IVF cycle. I never understand it when people say things like “it’s hellacious” or “the worst thing ever.” That is so not say that the process isn’t stressful at times, but I view my last IVF as a time of wonder an excitement. I felt lucky to live in a world where science makes things like IVF possible, and even luckier that I was privileged enough experience it. When I began that cycle I made a commitment to surrender and to view whatever happened as part of the journey. I read a fortune a few days before I started that said, “Now is a wonderful time for a new adventure.” And that’s exactly how IVF felt to me — an adventure. As you know, in the end I had a miscarriage, but I’m still grateful for the experience. Tanya, your enlightened perspective fills me with joy! Thank you for sharing. Wow! I so needed to hear that. What a great way of looking at all of this!